A few months back, my husband mentioned to me that he had a really good almond croissant from a patisserie near his workplace. That got my attention. So not long after that, when I spotted a recipe for "perfect almond croissants" from Chocolate and Zucchini, I quickly pinned it. I have a pinterest account that I use mainly to pin recipes I spot online that I'd like to try. I've actually managed to make quite a number of those recipes that I've pinned! In this case, I've been constantly reminded of this particular almond croissant recipe because I get a few email alerts daily saying someone has re-pinned or liked it. So the constant reminder became a call to action and I made a few almond croissants for breakfast over this past weekend! I sometimes make a mock version of them using almond paste but actual almond croissants from a bakery start with day-old croissants. These slightly dried out croissants are brushed with sugar syrup and filled with an almond cream filling. The croissants are topped with a bit more almond cream and sliced almonds, then baked until the filling sets and the top and ends are crusty and golden. The best part? Well, there's the essential reward of ending up with rich croissants encased with almond flavor for all us almond-lovers out there (texturally, the crusty edges are especially tempting). Aside from that, these are a great day-ahead make-ahead. Buy croissants and prep both the sugar syrup and almond filling the day before. In the morning, slice the croissants, brush them with the syrup, fill them with the almond filling, and bake...you have fresh almond croissants for your weekend breakfast or brunch! Now, when a chocolate option presents itself, I'm almost always inclined to go there. Just add some cocoa powder to the filling and tuck a tablespoon of chocolate chips inside for chocolate-almond croissants! You can try both, like I did, and decide which version you prefer for yourself. For me, I actually liked the traditional, or pure almond, one more. It's rare that chocolate doesn't win out for me but once in a while, it can happen. This was easy to put together and I'm certainly happy I tried it! For this almond croissant endeavor, I started by buying 4 croissants (for what it's worth, making puff pastry or croissants is not on my list of things I want to try). Obviously, the better the croissant, well...the better! For convenience, I picked mine up at Whole Foods. Tuck those croissants away to dry out for a day. This allows the croissants to soak up the sugar syrup more, which in turn prevents the them from burning while they bake (almond croissants are twice-baked, essentially). In the meantime, make the syrup. For 4 croissants, or half the original recipe, it's just half a cup of water and a tablespoon of sugar. I didn't bother using the stove and simply heated the water in the microwave and stirred in the sugar to melt. You can add a splash of rum for an extra boost of flavor but since I was thinking about my son, I omitted the rum and added a little bit of vanilla extract instead. The syrup literally takes a minute to put together. Next comes the almond cream filling. It's made with almond flour, sugar, butter, a touch of almond extract, salt, and an egg. Since I was making a small amount, I simply mixed it together with a spatula/wooden spoon. It's very easy and fast to do. Slice the croissants (not all the way through) and soak them thoroughly on top and inside with the sugar syrup. Then spread about 2 tablespoons of almond filling inside each. Another tablespoon of filling goes on top, then place some sliced almonds over that. I assembled two with the regular almond filling, then moved on to the chocolate version. I mixed in 2 rounded teaspoons of cocoa powder into my remaining almond cream and filled the croissants with it. In addition, place about a tablespoon of chocolate chips inside each; that makes for a strong chocolate flavor. All prepped, they're ready for a 350 degree oven. The almond croissants are done when the filling is firm/has set and they're golden, which takes about 12-15 minutes. The almond filling will spill over and ooze down the sides a bit. The crusty bits are arguably the best part! And that sums up our Saturday morning breakfast scene this past weekend. I had fun making this and I think we all had fun tasting it. It's good to try something new and enjoying a decadent pastry certainly has its place in our weekend household routine. If desired, you can prepare the syrup and almond filling a day ahead and assemble the almond croissants in the morning. Prepare syrup: Heat water in a measuring cup in the microwave until hot. Add sugar (and rum or vanilla extract, if using) and stir until sugar is melted. Set aside to cool, then cover and refrigerate if not using until the next day. Prepare almond filling: In a bowl, stir almond flour, sugar, and salt together with a wood spoon or sturdy rubber spatula. Add butter and stir together until well combined. Add almond extract and egg, beating the mixture together until creamy. If not using until the next day, cover and refrigerate. Assemble and bake almond croissants: Preheat oven to 350 degrees. Line a baking sheet with parchment paper. Using a serrated knife, slice each croissant open, not all the way through but leaving a "hinge" so it opens like a book. One at a time, soak each croissant generously with the sweetened syrup. Coat the outside, inside, and ends. The croissants should be quite moist. Spread 2 tablespoons of almond filling inside each croissant. Top each croissant with another tablespoon of filling and sprinkle the tops with sliced almonds. Bake until cream is set and golden, 12-15 minutes. Remove from the oven, let cool, and dust with confectioners' sugar before serving warm or at room temperature. * For chocolate-almond croissants: Adjust filling by stirring in 1 1/2 tablespoons unsweetened cocoa powder. Use this filling for the croissants and place about 1 tablespoon chocolate chips inside each croissant. Continue and bake as directed. These look almost too good to be true! Is there a better way to start the day?! A pastry with a good cup of coffee, a cappuccino, makes for a great weekend start, right! I have absolutely dreamed of making my own almond and chocolate croissants. You are my hero! They are beautiful and I bet incredibly tasty. I wonder how hard the whole thing would be to make. We should give it a whirl! You could do it beautifully, I'm sure, Tricia. There have been, and still are, plenty of things I want to try to make but puff pastry dough has never been on that list. I have to admit that I don't particularly crave croissants - that might be one reason. : ) That, or I know I'd make a mess of it! This was so easy with the store-bought croissants to start with. YUM! Almond, chocolate and croissant..the combination is for sure the killer! Whoever thought of this way of using day-old croissants was very smart! I never knew it could be this easy! I don't know which one I would go for they both sound so amazing... maybe one of each?? Hi Monica, like your idea to make both chocolate and almond, they both look so perfectly flaky and delicious. You are the best baker! I barely had to do much since I bought the croissants, Cheri! Thank you still. : ) I could not resist the chocolate version (my son also wanted to make sure I did the chocolate one as well). I always buy the chocolate one for my daughter. These look gorgeous. I can’t wait to give these a try at home. Yes, I bet your daughter would enjoy the chocolate and overall, the almond cream is kind of irresistible if you love almond pastries as much as I do. Wow! 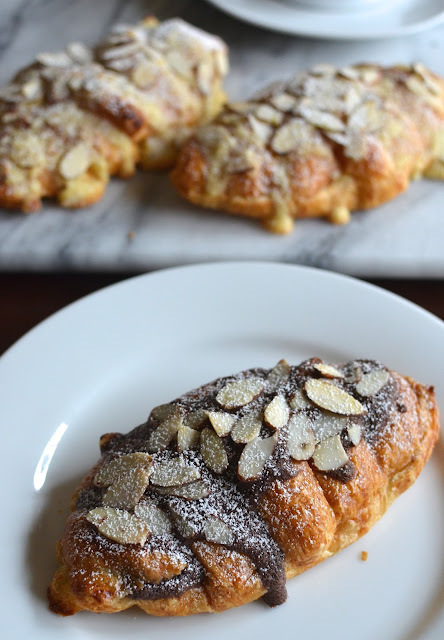 Chocolate almond croissants? What else I can ask for. This is such a beautiful and delicious share, Monica. Can't wait to try chocolate version! Glad you like the chocolate version. How could I resist stirring in a little cocoa and adding some chocolate chips. Easy and tasty! Whoever thought of making almond croissants to make use of day-old croissants was a very smart person, for sure! Anything using almond extract immediately has my heart!! haha These croissants look so good! I love the chocolate version :) And I definitely wish I had one as a snack right now! Both versions look extraordinary! I wish i had these two for breakfast today! Appreciate it! It's always fun to try something you've never made and this was one of those and very easy with the store-bought croissants. This is one of my favorite pastry! 4 days old croissants? Wow, that was shocking surprise! These look great and I'm an absolute sucker for an almond croissant. Theres just something magical about them, especially when they're warm. Great reasons for making them at home. Thank you!